The Australian Cotton Research Institute (ACRI) is owned by NSW Department of Primary Industries (NSWDPI). ACRI is located between Narrabri and Wee Waa in the centre of New South Wales' main cotton production areas. The facilities are shared with the CSIRO Agriculture and Food. Research activities at the ACRI have played a key role in the development of cotton in New South Wales and Queensland. Scientists at ACRI are assisting the cotton industry to develop a sustainable future based on productivity and best practice natural resource, disease and pest management. ACRI has both research and extension programs. While the emphasis at ACRI is on cotton, the institute also engages in agronomic research encompassing summer and winter grain crops including canola, chickpeas, safflower, linseed, soybeans and mungbeans. The Institute is located on the banks of the Namoi river. The site consists of 277 hectares of land with 183 hectares being irrigated. It includesglasshouses, laboratories, cotton gin, controlled environment growth rooms, insectaries, workshops and conference rooms. The Institute competes strongly for external funding support for its research and extension activities from industry bodies, state and federal organisations. The Institute undertakes insecticide resistance monitoring programmes for the Australian Cotton Industry. The Institute has extensive insect rearing facilities on site for its research activities. two spray mantis spray rigs on the station for the application of herbicides and insecticides in small plot experiments. The insecticide boom has the capacity to be carrying 8 different chemicals simultaneously. Each can be applied with their own water rate, pressure setting and nozzle type with the flick of a switch. This ensures treatments are applied in a timely manner and that each chemical is applied using parameters that maximise its potential efficacy. ACRI has two on-farm storage dams for irrigation, one dam holds 20 megalitres and the other holds 50 megalitres. The property has a 212 megalitre bore licence and a 1,458 megalitre river licence. Within the farming system there are 6 irrigation water pumps. Two are used for pumping from the river and the remaining 4 pumps are used for water reticulation. 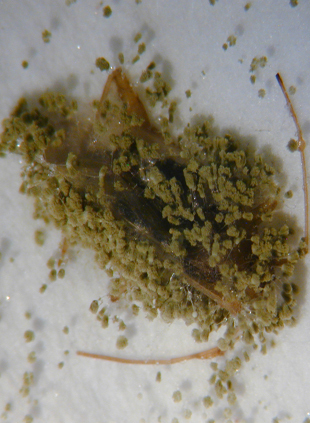 Green mirid infected by new fungal isolate is unaffected by toxin in Bt cotton crops. 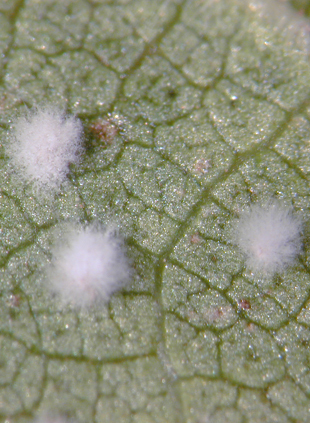 Cotton aphid infected by new fungal isolate is not affected by toxin in Bt cotton crops. The Soils team undertakes research to protect and enhance the physical, chemical and biological fertility of soil resources that underpin the cotton farming systems. 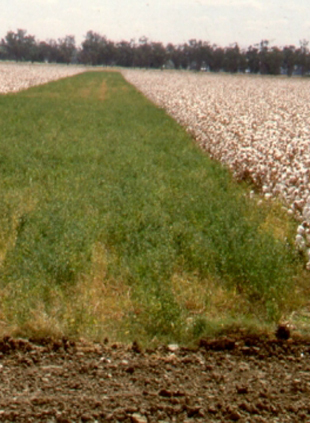 Focus research areas include quantifying the effects of crop rotations, tillage and stubble management on soil health, cotton productivity and water use economics of cotton farming systems in irrigated Vertisols. The biopesticide and integrated pest management (IPM) research focuses on the development of novel biopesticides and IPM strategies for use by the cotton industry. The biopesticides include entomopathogenic fungal insecticides and semio-chemicals derived from natural plant products. The insecticide resistance management research program focuses on the monitoring of insecticide resistance in major pests of broadacre crops particularly cotton and grains. This involves research in generating baseline susceptibility data, resistance monitoring and underlying genetics and biochemical mechanisms of resistance. NSW DPI supports the cotton industry by providing disease surveillance, diagnostic services, and world leading research to identify management options for growers to adopt to improve productivity and profitability. New knowledge developed during the life of this project combined with 30 years of NSW DPI survey data will allow the team to use their extensive expertise in cotton pathology to develop key components of decision matrices which will allow growers and managers to assess the risk of where and when to plant. The NSW DPI cropping systems unit have undertaken field experiments to examine optimum nutrition and irrigation management practices for the Northern NSW cotton industry. Investigating new management techniques and reducing excess nutrient lost from a farming system will improve the industry efficiency. The research is ensuring the industry is economically and environmentally sustainable, while leading to greater industry productivity. The NSW DPI northern cropping systems unit investigate the long term impact various farming management strategies have in northern NSW. Management approaches such as applying extra fertiliser, sowing more pulses, longer fallows periods through to double cropping systems are being investigated in the northern NSW environment. Upcoming weeds research will be based in an extensive collaboration between NSW DPI, CSU, QLD University and UNE into the Noogora Burr which continues to be a significant pest species. Work also continues into developing weed control thresholds. The scope of physiological and agronomic research encompasses summer and winter crops including canola, chickpeas, safflower, linseed, soybeans and mungbeans. Aims of the research include reducing production risk, improving crop production and reliability, and increasing crop profitability. 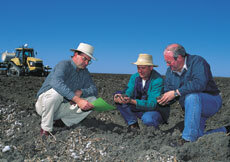 The development of tactical agronomic advice is supported by physiological understanding of crop growth and development. Currently work on benchmarking water use efficiency and crop productivity in the Australian Cotton Industry is being carried out from ACRI. The Australian Cotton Research Institute was established by the State goverment in 1958 to research grains, cotton and pastures. In 1972 CSIRO moved staff to ACRI from Canberra, Griffith and Kununurra to co-locate and colaborate with the NSW Department of Agriculture . Three successive Cotton cooperative research centres (CRC) operated from the site from 1994 to 2012. The ACRI is located in north western NSW and experiences similar climatic conditions to the township of Narrabri. The average summer max/min temperatures are 32ºC/20ºC [90ºF/68ºF] and average winter max/min temperatures are 19ºC/10ºC [66ºF/50ºF]. Rainfall is summer dominant, falling mainly as storms. The ACRI has had its own weather station located on the site since 1960. The on-site weather station measures a wide variety of climate details - including humidity and radiation. Data is updated hourly on the Narrabri Shire weather web site.